» Characters from DFW #15: SENOR ARNAZ DE LOBO — by Monte Herridge. Characters from DFW #15: SENOR ARNAZ DE LOBO — by Monte Herridge. #15. 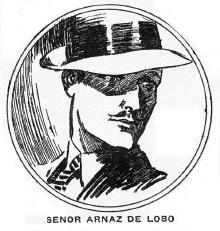 Senor Arnaz de Lobo, Soldier of Fortune, by Erle Stanley Gardner. 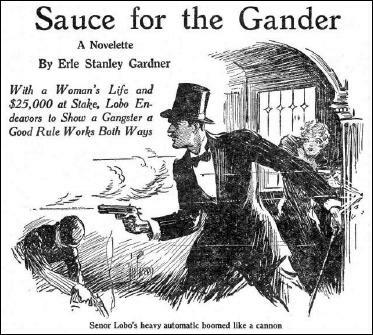 Erle Stanley Gardner (1889-1970) is probably best known for his long-running series about the always victorious lawyer, Perry Mason, but he also had hundreds of exciting stories in the pulps. Many of these appeared in Detective Fiction Weekly, where he had multiple series running: Senor Arnaz de Lobo, Sidney Zoom, Lester Leith, the Patent Leather Kid, The Man in the Silver Mask, and other standalone stories that could have been turned into series. The Lester Leith series seems to have been the most popular in the magazine, but the other series were popular as well. The Senor Lobo stories are fun, action-packed stories that were nothing like the other detective and mystery stories in the magazine. Senor Lobo and his friend, El Mono Viejo, are basically soldiers of fortune thrown into the midst of a city where they continually find adventure and danger. He reveals that he is only part Spanish — his mother was Spanish and his father American, and he himself is an American citizen. This brings the question as to whether his name had been changed or was originally Lobo. He can speak not only English and Spanish but also French and Chinese. He fought in Central and South America and also in China and Africa. Although Senor Lobo often uses guns in the course of his adventures, his favorite weapon is his sword cane. It has a retractable blade, and Lobo often uses it in confrontations with criminals. Lobo kept weapons of various kinds in his car that would be of use in close quarter fighting, including hand grenades. Unfortunately, Lobo’s adventures were rough on equipment, and the car was shot to pieces by a machine gun in “Broken Eggs.” However, doubtless he had it repaired or acquired another because cars were indispensable in his work. In virtually every story the soldierly professionalism of Lobo and his lieutenant are stressed, and the lack of such qualities in their gangster opponents is also stressed. In fact, the gangsters’ lack of ability to handle the tactics of the two soldiers of fortune is shown to best effect in the story “Barking Dogs.” Here the two soldiers raid a gangster headquarters in order to rescue a woman, and defeat a gangster mob many times their size. Afterwards, the gangsters claimed to the police and newspapers that twenty rival gangsters had raided their stronghold, and asked for a police investigation. Clearly, they never knew what hit them. The series, which ran for 23 stories, starts out with basically a two-part beginning, though each can be read separately and were published four months apart. In “The Choice of Weapons” and “Gangsters’ Gold”, the two parts of the opening story, Lobo is up against a hard fight with Butch Pender and his gang. These early stories are full of action, with Lobo out-maneuvering the gangsters twice in their attempt to rob gold from a bank. Lobo originally came to the U. S. in response to a strange situation. It seems that a dying American gangster named High Test Barker, wanting revenge on his enemies, makes a will leaving $70,000 in gold to Senor Lobo. The will makes the condition that Lobo can have the money only if he avenges Barker’s death. So Lobo comes up to take care of the situation and steps into what might be termed a hornet’s nest of trouble. The first stories are based upon this plot. After it runs its course, Lobo becomes involved in one adventure after another in the city. The series seems to have quite a lot of the influence of Leslie Charteris’ series about The Saint (who appeared in DFW itself in 1938-39 and 1943). However, there was nothing like it in the magazine during the series run from 1930-34. Detective Fiction Weekly boasted many series, and none of them were remotely similar to Senor Lobo. Plenty of professional detectives, both private and government, ran through the pages. Also plenty of amateur detectives of all kinds appeared in stories. Senor Lobo fell into none of these categories. He was a professional who enjoyed what he did as a mercenary and revolutionary, as well as his new work as a gangbuster. He does eventually leave for another revolution — in the last story, “Opportunity Knocks Twice”, he and his assistant leave the city for Latin America for this purpose. So they wander the streets until, finally they find some trouble to get involved in. Trouble in the form of a kidnapping of a wealthy woman. Lobo involves himself in the matter to the extent that he goes after the kidnappers and in a couple of violent shootouts wipes them out. He returns the ransom money, minus what he takes for expenses. Lobo gets involved in more conflicts with criminals by investigating any strange occurrence that strikes his interest. After things quieted down too much, he got the idea of paying taxicab drivers to report unusual occurrences to him. This helped keep Lobo busier, even if only part of the drivers’ reports led to action against criminals. Another example of Lobo’s penchant for getting into trouble occurs in “Carved in Jade”, an early story. This one starts in Chinatown, a popular setting for Gardner. Lobo wants to eat Chinese food, but his visit to a Chinese restaurant involves him with a group of gangsters who try to kill him in a trap. Lobo is up against both American and Chinese criminals in this story. One of the funnier stories is “Costs of Collection”, where Lobo and his friend are almost broke, thanks to their bank going under with all of their money in it. Far from finding it to be a bad situation, the two adventurers laugh about the situation and decide they have to make more money. “Caramba!” said El Mono Viejo, “but we need guardians, we two. We put money in a bank, and presto! We cannot take it out!” So Senor Lobo needs to find some gangsters to fight and money to appropriate. He uses almost the last of his money to pay for information from a cabdriver, and as a result finds some crooks to fight and a young woman to rescue. Coincidentally, Senor Lobo takes $10,000 in cash from some crooks as what he calls the “spoils of warfare”. So he is back in the money again. The Senor Lobo series was undoubtedly more fantasy than reality based, but it was the kind of crime-fighting stories that appealed to readers, as shown by the fact that it lasted for 23 stories and probably could have run longer. Each story features Senor Lobo and El Mono Viejo becoming involved in gangster activities, and usually culminates in a violent gun battle (sometimes with explosives used). Naturally, Senor Lobo always comes out on top and wins the girl when one is part of the conflict. El Mono Viejo told Senor Lobo “it was a wonderful idea of yours — this business of coming to the city and antagonizing organized crime.” (Opportunity Knocks Twice). He only complained when there was insufficient action. 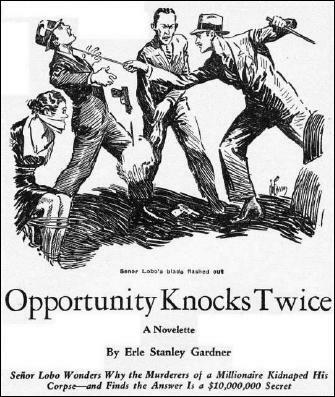 The last story, “Opportunity Knocks Twice,” is a fast-moving tale of action, started when a taxicab driver’s report of a very unusual occurrence puts Lobo on the trail of a $10 million secret and murder. At the same time, Lobo and El Mono Viejo are getting ready to offer their services to a revolutionary, who is in the city buying arms for a revolution in Latin America. If he doesn’t want their services, then they will offer them to the opposing side. By this time, El Mono Viejo is tired of the “guerilla warfare” with the city’s gangsters, and wants nothing more than to leave so they can get involved in a war or revolution. So the story is of the two mercenaries running around trying to resolve the murder and at the same time keep an eye out for when the time is ripe to leave for Latin America. So the series has a conclusion of a sort, as the two prepare to leave the city they have lived in for over four years. It is certain that the criminals will not miss them. This is an excellent series that deserves reprinting. As this series was finishing its run in 1934, another series was beginning that seems to show some influence of Senor Lobo: the Park Avenue Hunt Club series of Judson P. Philips. This was a small group of men who were devoted to fighting gangsters, and enjoyed their work. Though it is doubted if they ever enjoyed it to the extent that Senor Lobo did. Note: An earlier version of this article appeared in Blood ‘n’ Thunder magazine (#16, Fall 2006). 13. HUGO OAKES, LAWYER-DETECTIVE, by J. Lane Linklater. 14. HANIGAN & IRVING, by Roger Torrey. The above comments are submitted as my personal opinions from a different time and place. Back in 1980 I would have said that it would be very unlikely for this series to ever be reprinted. Now, with all the many pulp reprints, I’m sure a collection will be published. Of all of the Gardner stories I’ve read, and believe me there have been lots of them, I can’t remember ever reading one of Lobo’s. I’m sure I’d remember, too, as he certainly sounds different from the usual run of DFW characters. I almost said “unique,” but Monte, your suggestion that Gardner may have been inspired by Leslie Charteris’s Saint stories seems well-founded. Those early Saint stories had a lot of verve and romantic action to them, and while Lobo’s adventures may not be as memorable — while The Saint is remembered today, Lobo surely is not — I’m sure I’d enjoy reading a few. Put me down as someone who’d like to see a collection of these stories published, maybe even two. How many characters have been mentioned as inspiration for The Saint? Raffles, Lone Wolf, Boston Blackie, and now Lobo, I have read each mentioned with The Saint. Of course, that is nothing against Charteris or the character. After all, how many characters allegedly inspired The Batman? Monte did a good job bring Lobo to life here. How did each of Gardner’s series characters differ? What character did Gardner turn to after stopping the Lobo stories? In this case it has to be the inspiration, if any, was the other way around — The Saint came first, in 1928, then Senor Lobo, in 1930. Whether or not Gardner would have had a chance to read any of the Saint stories is a question that would have to looked into. The concept of roguish adventurers may have been a idea that a number of authors may have picked up on independently, or from a single earlier example such as those you mention, Michael. 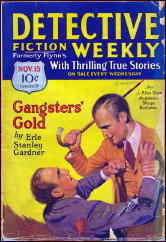 In the years before Perry Mason came along (in 1933), Gardner created a host of series characters for the pulp magazines, trying to find one, perhaps, that would catch the public’s eye more than another: Ed Jenkins (The Phantom Crook) and Lester Leith, a Raffles-type character, as two prime examples, and Ken Corning, a lawyer-type character that foreshadowed Perry Mason in a lot of ways. Somebody really ought to do an article that answers those questions in your last paragraph. If I were younger, it might be me, but I’m not, and it won’t. The roguish adventurers were around in the pulps even before The Saint and Senor Lobo. DETECTIVE STORY MAGAZINE in the teens and twenties had many series, one of the strangest was The Picaroon by Herman Landon. The first story was a serial in 1921 starring Martin Dale, alias The Picaroon and his adventures continued until 1932. Some made it into hardback. The Picaroon was a thief who would steal and then leave a card saying the stolen goods would be returned once 10% of the value was contributed to the Society for the Prevention of Cruelty to Animals. Humor was a part of these stories and Johnston McCulley had several such heroes in DETECTIVE STORY in the teens and twenties. I mentioned some in my piece on DETECTIVE STORY that appeared a couple years ago in MYSTERY FILE. Robert Sampson in his 6 volumes on the pulps titled, YESTERDAY’S FACES, called such pulp rogues “bent heroes”. Walker Martin (or anyone): Are the Robert Sampson books “Yesterday’s Faces” worth tracking down? I’ll allow Walker (or anyone) to expand on this quick response, if he wishes, but if you’re a fan of the pulps or pulp heroes, the answer is Yes, by all means. Yes, Rick I definitely recommend the 6 volumes of YESTERDAY’S FACES. All or some of them are still in print. If not in print they are easy to order on the used book market like abebooks.com. They also are in paper editions. If you have any interest in the pulp magazine era of 1900-1955, then these books are a must. Now having said that I have to admit to a close connection with these books. During the years 1969 right up to his death at an early age in the early 1990’s, Robert Sampson and I corresponded with letters(remember this is pre email) on an average of 20 or so letters each year. In other words for about 25 years we wrote each other hundreds of letters, perhaps 500 in number. The subject was always about pulp magazines, the writers, editors, and artists. Because of my extensive collection of pulps, Sampson used me as a research source in writing his books and articles. For instance, he might be writing about a series character from DETECTIVE STORY or DETECTIVE FICTION WEEKLY, and he would inquire as to the date and number of stories, etc. He also would ask me about my opinion of the various stories and writers. I often told him it was not necessary to thank me, that I was just glad to see and help him in any way I could. My reward was seeing the result of his pulp research. When I see these 6 books on my shelves, I’m reminded that it does pay to encourage and help friends when they are writing books on pulps, vintage paperbacks, slicks, pulp art, etc. Thank you Walker (and Steve too). Last night after reading your posts, I ordered five of the six “Yesterday’s Faces” volumes (the cheapest volume six costs more than twice of any of the others), so I’ll hold off on that one. Walker, I envy you your relationship with a writer of such dedication and shared interests. The pulp magazines dealt in fiction that was, by reason of the audience and the medium, heightened beyond normal experience. The drama was intense, the colors vivid, and the pace exhausting. The characters moving through these prose dreams were heightened, too. Most were cast in a quasi-heroic mold and moved on elevated planes of accomplishment. This book and its companion volumes are concerned with the slow shaping of many literary conventions over many decades. This volume begins the study with the dime novels and several early series characters who influenced the direction of pulp fiction at its source. The second volume within this series presents more than fifty series characters within pulp fiction, selected to represent four popular story types from the 1907–1939 pulps—scientific detectives, occult and psychic investigators, jungle men, and adventurers in interplanetary romance. Some characters—Tarzan, John Carter of Mars, Craig Kennedy, Anthony (Buck) Rogers—became internationally known. Others are now almost forgotten, except by collectors and specialists. More than forty criminal heroes are examined in this volume. They include evil characters such as Dr. Fu Manchu, Li Shoon, Black Star, the Spider, Rafferty, Mr. Clackworthy, Elegant Edward, Big-nose Charlie, Thubway Tham, the Thunderbolt, the Man in Purple, and the Crimson Clown, plus many, many more! The development of these characters is traced across more than two decades of crime fiction published in Detective Story Magazine, Flynn’s, Black Mask, and other magazines. The conventions that made these stories a special part of popular fiction are examined in detail. For the fourth volume of this series, Robert Sampson has selected more than fifty magazine series characters to illustrate the development of the character of the detective. Included here are both the amateur and professional detective, female investigators, deducting doctors, brilliant amateurs, and equally brilliant professional police. There are private detectives reflecting Holmes and hard-boiled cops from the parallel traditions of realism and melodramatic fantasy. Characters include Brady and Riordan, Terry Trimble, Glamorous Nan Russell, J. G. Reeder, plus many others. In this fifth volume of the Yesterday’s Faces series, Robert Sampson has selected a host of series characters who adventured throughout the world in the 1903–1930 pulps. Sparkling brightly among these characters are Terence O’Rourke, Captain Blood, and the ferocious Hurricane Williams. More characters include Peter the Brazen, in China, Sanders of the River, in Africa—and much, much more. Adventure, suspense, above all violence-these filled the lives of the characters brightening the pulp magazines. From the early 1900s to the 1950s, these magazines of popular fiction offered hard-paced entertainment and high wonder. In “Violent Lives” Robert Sampson calls up a vivid selection of adventurers, spies, and warriors. I remember telling Sampson that volume three of YESTERDAYS’S FACES could be just about retitled THE SERIES CHARACTER IN DETECTIVE STORY MAGAZINE. In the fourth volume he continues with more series from DETECTIVE STORY but also has quite a few from FLYNN’S/DFW. All six volumes add up to quite an accomplishment. When Bob Sampson died of some type of terminal illness, I could not believe the silence in my life. To correspond for over 20 years with someone and then complete silence. Here it is 20 years since his death and I still miss his letters talking about pulps.